ENJOY YOUR FONDUE PARTY ! 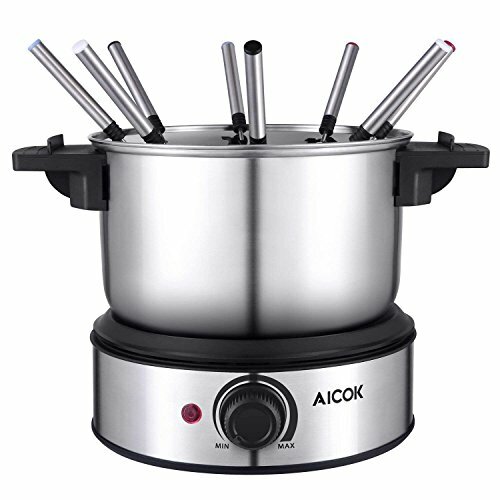 Your party with your dear friends or family is sure to be a success with Aicok electric fondue pot. It keeps the fondues nice and hot while constantly keeping temperature! The nonstick fondue set will accommodate all of your favorite fondue recipes, including chocolate, cheese, broth or oil. You can enjoy dipping dinner without going to a fancy restaurant and spend hundreds. So call the family, or invite friends over to relax with a variety of great-tasting fondues, then enjoy easy, dishwasher safe cleanup! The bowl can also be used separately on induction cookers. Dimensions: 9.8 x 9.8 x 8.1 in. We offer 2 years warranty and provide the best and friendly customer service ready to solve any question or inconvenience you have. MULTI FONDUE POT - 3 in 1 fondue cheese, fondue chocolate and hot pot. Dipping fruit and pastry into melted chocolate and cheese or cooking hotpot, makes a party a hit. 8 FORKS FONDUE SET - This is a set comes with 8 fondue forks that are colored so you'll know which fork is yours, and a fork holder serves you better. ADJUSTABLE ELECTRIC FONDUE POT - It allows you to control temperature and heats fast. It's consistent to keep the fondue smooth and liquid but not so hot that it burns. DETACHABLE FONDUE FOUNTAIN - Detachable parts are dishwasher-safe for easy cleaning up. The bowl can also be used separately on induction cookers. NONSTICK DESSERT FOUNTAIN - Stainless steel pot has reliable quality and is nonstick. Capacity of 1.5 quart (48 ounce). 2 years warranty included.